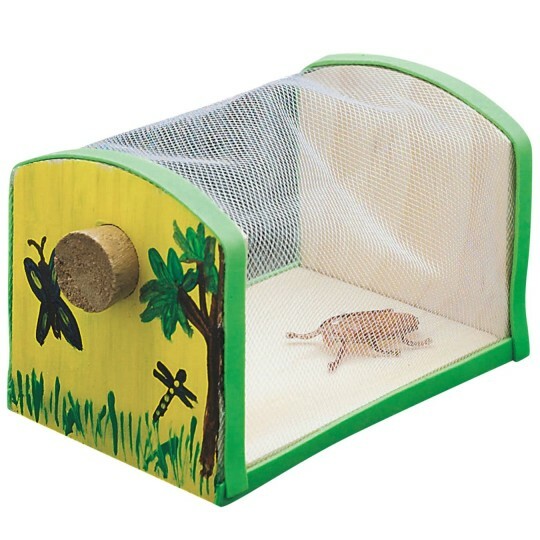 12 view 'n learn bug houses! Finished project measures 3" x 3" x 4-1/2"
I got this for my VBS class. They really enjoyed making these. Great project. This looks good but is really difficult for young boys Cub Scouts to do without a lot of assistance. I used this for an insect-themed GS day camp. The girls loved painting them. I gave each a real cricket for their bug house and we discovered that the crickets easily ATE THROUGH the mesh. Fortunately crickets don't live long so I didn't get too many complaints about the now loose crickets in houses and cars. But the one family with 4 girls at camp and 4 loose crickets in their family room were not thrilled! The netting was hard to tighten and looked sloppy. The edging kept peeling back up.